Times Square | A Maths Card Game That Makes Maths Fun! Times Square is an exciting, cooperative maths card game that makes learning and practising times tables fast and fun. Team up, play together, and clear Times Square of Zombies! Times Square is the perfect blend of entertainment and education. Love maths or hate maths, playing this maths card game makes learning times tables exciting and fun, even for children who struggle with maths, lack confidence or are maths adverse. Combine dice in any way you can think of; add, subtract, multiply, and divide. The design of the game allows players of mixed maths ability to happily play together. Every Zombie card has a Targeting Wheel to help less confident players (including adults!) with a hint or two showing useful number combinations. Times Square makes maths fun for everybody. There are no wrong answers to make you feel stupid. Everyone playing helps each other, working together to win. Times Square is a “Maths by Stealth” game. Children won’t know they’re learning their times tables when they’re busy rolling dice, having fun, and battling Zombies! The aim of the game is to clear all the Zombies out of Times Square as fast as you can. Combine dice using addition, subtraction, multiplication, and division. Even squaring and square roots can be used to reach the number on the Zombie card to ‘defeat it’. Take turns to roll the dice! All players work together to find the best dice combination to defeat Zombies. 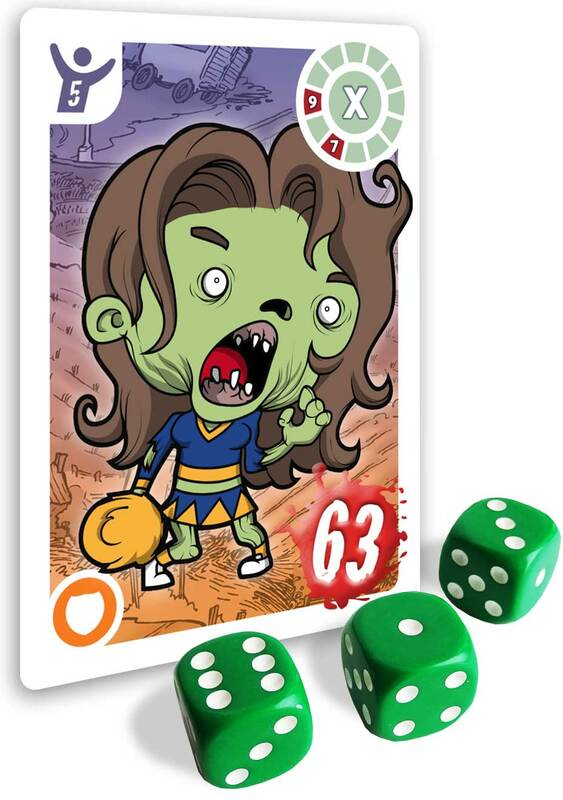 Add, subtract, multiply, and divide your dice to make a result that matches the number on a Zombie card to defeat it! Different dice can be used to hit more than one Zombie on your go! Flip any defeated Zombie cards face down. Times Square is a maths card game that’s designed to help children understand, apply, and practise their times tables in a fun, supportive, and non-threatening way. It’s the perfect blend of entertainment and education. Players work together to defeat the Zombies by rolling and combining dice and using addition, subtraction, multiplication, division, and even squaring, and square roots to match the number on the Zombie card. If they can match the number, that Zombie is destroyed! Times Square is the perfect maths card game for school maths lessons, maths clubs, or for home education with the family to sneakily improve maths skills! In Times Square, everyone either wins or loses together. Cooperative play ensures confident players can support teammates who are struggling, suggesting different ways of using the dice, or game tactics, but the final decision is always left to the current player! Find out how to get started with Times Square and how to improve maths ability through play! We’ll show you how you battle Aliens and Zombies, tell you about the different cards you get in the game and more! The invasion has begun! Game 1 is the perfect place to start your Zombie number crunching! Transformation! Game 2 ups the difficulty more as you try to transform Zombies back into humans! You’re outnumbered! This game mode has you save the heroes while surviving the Zombie horde! • Times Square is a complete maths card game and comes with everything you need to play. • You can use cards from Times Square with the City of Zombies board game and vice versa. Some of the icons on the Zombie cards are only used in City of Zombies. • There are 3 different maths card games included, and each game can be made easier or harder with a few simple changes to the rules, it’s all in the rulebook. • You can play competitively if you want. Each player collects the Zombies that they defeat. The player who has defeated the most Zombies at the end of the game is the winner. • We’ve worked with Colour Blind Awareness to ensure that Times Square (and City of Zombies) works with all types of colour blindness. Book a fun day of maths games for your school or home education group! We have a range of maths card games to get your classes or Home Ed group engaged and excited about maths with City of Zombies, Times Square, or for younger gamers, Alana’s Animals. These maths games are an extremely powerful way for children to practice their mental arithmetic, times tables, and help improve numeracy through play. 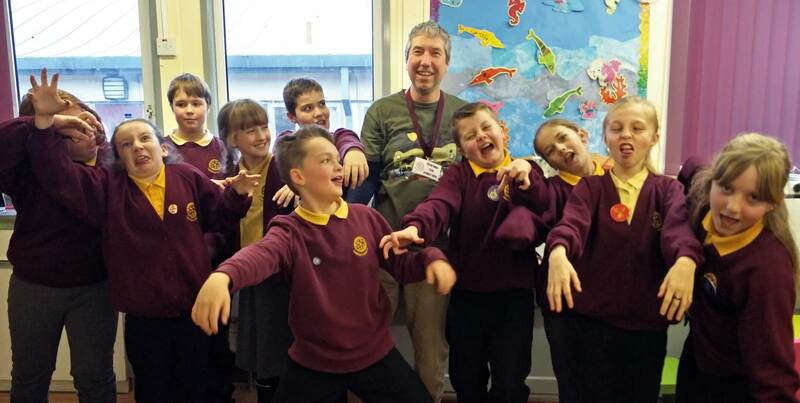 The Maths day will be hosted by award-winning games designer, Matthew Tidbury. Matthew has been developing educational board games at his company, ThinkNoodle Games, for over 12 years. Times Square is designed to work with the National Curriculum, has been recommended by National Numeracy, and is a powerful learning tool that makes maths fun. “I was inspired to create a times tables maths card game that worked in a similar way to my first maths game, City of Zombies. I’d been asked if I could create a times tables game with Zombies that go up to 144, which is what Times Square focuses on. Playing Times Square allows children practice and apply the 12 times table in a fun, engaging, and entertaining way. Anyone can play using the maths they know, while the game encourages and rewards players for learning new maths skills at the same time. The game is perfect to play at home, in game, or after school clubs. It is used in primary and secondary schools across the UK and beyond! A cooperative, brain-crunching, and award-winning maths game developed to help reinforce children’s maths skills (KS1 & KS2). 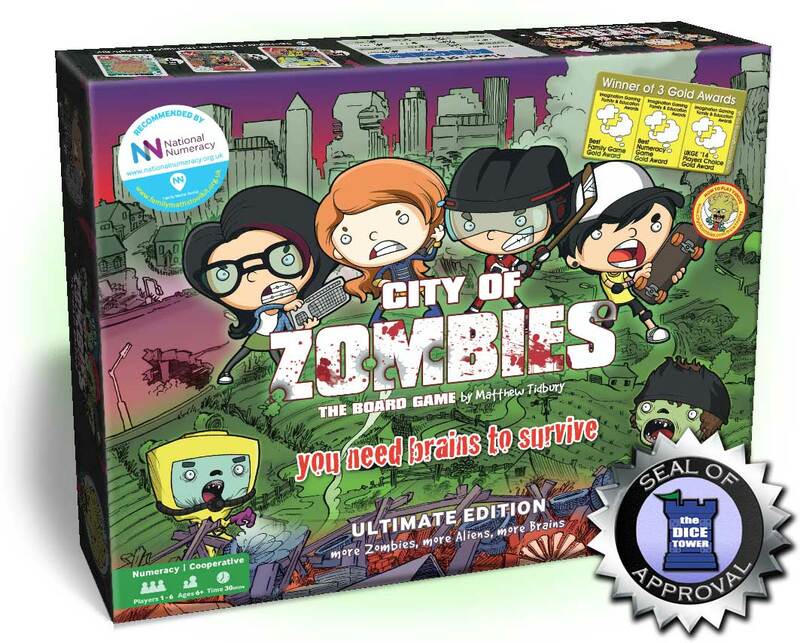 In City of Zombies, players must use dice rolls and maths sums to defeat waves of Alien Zombies. It’s family-friendly, fun, and simple to pick up and play, all while secretly boosting their maths ability without them realising! 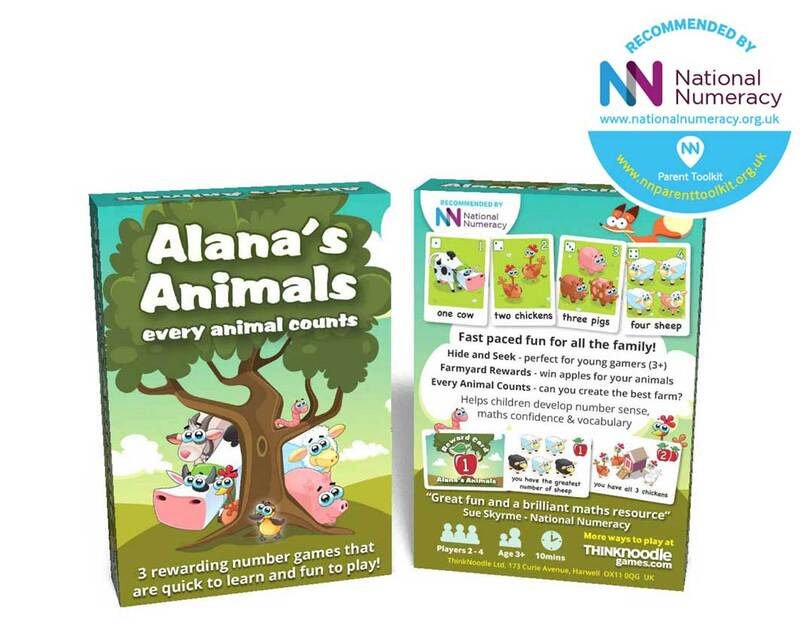 Perfect for younger children, Alana’s Animals is a card game that reinforces the basic maths, logic, and counting skills to give young children a head start at school. In Alana’s Animals, players take it in turns to collect groups of animals to grow their farm and score apples. The more apples they have, the more points they earn at the end of the round. It’s simple, easy, and makes learning fun. ThinkNoodle Games is an independent games publisher founded by award-winning designer, Matthew Tidbury. ThinkNoodle focuses on creating powerful educational tools hidden within exciting and engaging games. ThinkNoodle Games is always busy developing a range of educational games with the help of parents, teachers, educational organisations and authorities. If you’d like to find out more about our games, philosophy, and outreach, head on over to ThinkNoodle Games. If you’re a parent, teacher, home educator, retailer, or a school interested in working with us, please use the form below to get in touch. When you click submit, your message will be sent to us as an email.